Ready to plunk down the cash for a Samsung Galaxy S6 pre-order? You might as well think ahead and buy a case already. As you can see, case manufacturers have been busy getting a selection of accessories out in time - in fact, they are quite a bit early! So if you are going to be an early Galaxy S6 adopter, suit yourself with one of these fine cases. They are all on Amazon, so you don't have to mess around with imports from other countries. Check them out, hopefully you'll find a perfect fit for your new Galaxy S6! -Precise cutouts for improved access to all ports, buttons, cameras, speakers, and mics. -Compatible with Samsung Galaxy S6 - Verizon, AT&T, T-Mobile, Sprint, International models. -Raised Lip Protects Galaxy S6 Screen and Camera From Scratches. -DIY Customization by Inserting Images to Personalize Your Phone. -Premium TPU Polycarbonate Shock Absorbing Bumper and Crystal Clear Scratch-Resistant Back Cover. -Designed for the Samsung Galaxy S6. -Prevents S6 slip from protective case. already ordered my green s6 edge clear view case with screen protector. i might buy a clear one too. Green one is nise for St.Patrick. Unfortunately, may be next year. Then What posts do you need? It is like when an iphone is launched, If PA posts about Xaomi or Meizu. When a popular phone is launched most posts will be about that popular phone. and I assume PA also forces you to read these posts ? Its a free site, read what you like don't what you don't. Make the next month, young man. That's what Galaxies and iPhones so great ! The kind of accessories and availability is simply unparalleled by other OEMs. Its factors like these that are considered by consumers actually interested to buy. Apart from geeks and nerds a regular customer couldn't care less about using more then 32GB. Actually they don't. Many of the coolest cases are semi transparent, and allow you to see the phone. I will be watching youtube when the phone comes out. If there are suddenly a ton of people posting cracks or shattering glass, I'll get a case; otherwise no. Perhaps a clear case? If you don't mind a bit of extra bulk they give the protection and still show off design. 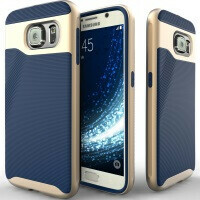 damn, those aftermarket case make S6 looks ugly... it make S6 just loss it characters. I prefer samsung own case that complement it design. Lmao the Samsung Galaxy Series, one of the only lines of phones where a case can cover your buyer's remorse.